Usually, when I eat at a restaurant I have a pretty good idea whether I’ll enjoy it fairly early on. First impressions are important – the welcome, the service, the room, the menu – but even if they aren’t good, you normally know by the time you taste those first few forkfuls of your starter. Not to say there aren’t still chances to save the day: a knockout main course can redeem all sorts of prior disappointments, although by that stage it’s increasingly unlikely. And if everything else has underwhelmed you up to that point, a dessert (if you order one) is only going to be damage limitation, however magnificent it might be. Tutu’s Ethiopian Table was a huge puzzler for me, because it didn’t fit that pattern at all. I was undecided from the moment I sat down to the moment I finished, and even afterwards I found myself mulling it over and weighing it up for quite some time. This in itself puts me out of step with most of Reading: Twitter is regularly awash with people raving about Reading’s well-established Ethiopian restaurant, not to mention the string of awards and mentions in the national media (one of my friends, ever the curmudgeon, was the solitary voice of dissent – “good luck with that, it’s just slop” he said when I mentioned that I was planning to pay it a visit). I liked the service at the counter, too – no table service which makes sense as Tutu’s is only part of the Global Café which also does coffee, tea and all sorts of interesting alcoholic and non-alcoholic drinks, some of them Fairtrade. Everyone was friendly, engaging and genuinely funny (“I’m going to blow your mind now,” said one of the bar staff to another customer, “I’ve accidentally dished up your cappuccino in a latte cup and your latte in a cappuccino cup”). I wasn’t so convinced about the unsmiling, functional service from the staff at Tutu’s, who just plonked the plates on the table and left. The menu gave a choice of seven vegetarian dishes and four meat dishes, with a choice of rice or injera (a thick, flat pancake), or you could opt for a platter – one meat dish and two vegetable dishes – for the same price. We went for platters, partly out of indecision and partly to try as much of the menu as possible. The indecision was strangely appropriate, because if I couldn’t make up my mind about the experience of eating at Tutu’s, it turned out that I couldn’t make up my mind about the food either. So I liked the doro wot, chicken on the bone in a rich spiced sauce. I liked that an awful lot, in fact. The chicken was so soft, so tender and so well cooked that taking it off the bone was no challenge at all, and once I’d done that I was struck by how much of it there was. The sauce was magnificent too, sticky and delicious with a heat which gradually, subtly developed without ever being too much. By the end of the dish my mouth had a wonderful, warm glow; if I went back to Tutu’s, I think I’d just order this dish, as nothing else I tasted came anywhere close to it. 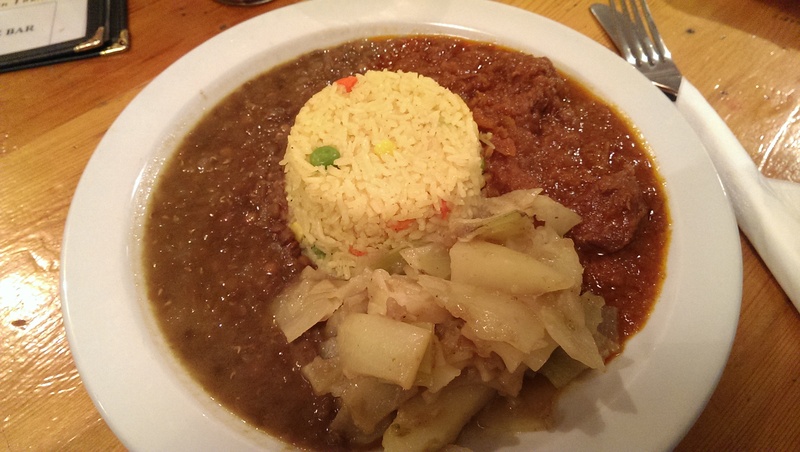 I didn’t like the keya sega wot – beef in a remarkably similar sauce – anywhere near so much. The beef was everything the chicken wasn’t. It needed a lot more cooking; none of it passed the two forks test and one piece was downright wobbly in a way best not remembered, let alone written about. There also wasn’t much of it – I counted less than half a dozen pieces, none of them huge. I liked the injera, like a thick flat sourdough crumpet you could tear off and use to eat your food, almost an edible plate (and who among us has never fancied one of those?). It was a bit of a soggy experience, perhaps, but still a fun one – and the slight vinegary note in it worked better with the sauce than I expected. I was less keen on the rice – a little dome of yellow rice with what looked suspiciously like frozen vegetables in it, it didn’t feel like it added an awful lot to proceedings. This, I’m afraid, is where I largely ran out of likes. The vegetable dishes were bland variations on a theme, and it’s hard to be positive about any of them. Fosolia, described as “a dish of subtly flavoured fried green beans and carrots” was a mulch of green beans and what looked like tinned or frozen carrots which tasted of beans, carrots and nothing else (so very subtly flavoured, then). I couldn’t see how this could possibly have been fried, either, because fried food doesn’t normally wind up this damp. White cabbage and potatoes and collard greens and potatoes were very close relations and again, were basically soggy brassica with cubes of potato. One was apparently cooked with exotic herbs and spices, but it reminded me of my school dinners and trust me, there was nothing exotic about those. The other featured garlic, in theory at least (I could barely tell the two dishes apart). Last of all, the difen misr wot, green lentils in sauce, was impossible to either like or dislike. The lentils had a nice bite but it was just a puddle of brown blandness. Maybe nothing could live up to the sauce which came with that chicken and beef, or perhaps my palate just isn’t developed enough to pick up both ends of the spectrum in Tutu’s food. I’m not sure I could tell which it was by that stage, and worse still I’m not sure I cared. I’d rather end on a positive, so I will say that my Ubuntu Cola – a fairtrade African version that is never going to appear on a tacky red festive truck outside the Oracle – was very tasty indeed. But then, like much of what I enjoyed in my visit, this had more to do with the Global Café than it did with the restaurant. The whole bill came to around twenty-three pounds, and to my shame I left really, really wanting a big slice of cake somewhere else. So, did I like Tutu’s Ethiopian Table? I should have, I wanted to, but did I? I don’t know, what do you think? One of the drawbacks of this gig is taking the photographs, especially when I visit a restaurant and find myself sitting in a very empty room trying to take sneaky pictures without the staff noticing (this is more of a problem in some places than others: where the service is poor you could probably get on a table and belt out I Will Survive without anybody batting an eyelid). Empty Room Syndrome happens much more often if I’m dining at quiet times, so Quattro immediately had me feeling hopeful when I rocked up on a Monday night to a bustling dining room. Why so packed, on a night when a fair few places don’t open at all? Well, Quattro is a popular place. At the time of writing it’s rated fourth on TripAdvisor among Reading restaurants, the highest rated place in Reading that isn’t a café. Customers rave about the food and the service, and many have posted multiple reviews. It’s celebrating its thirtieth birthday this year so I’m pretty sure that, along with Sweeney & Todd, it’s one of Reading’s oldest surviving restaurants. I’m never a big fan of the “so they must be doing something right” cliché, but it’s hard to argue with a restaurant full of customers on one of the deadest nights of the week. So all that set my expectations high, but my first interaction with the waitress dampened them somewhat. I could make out a blackboard with specials, but I couldn’t read it so I asked the waitress what they were. Her reaction was an interesting one. She didn’t know them by heart. She didn’t say she’d forgotten her notes. She didn’t wander over, read them and come back or offer to ask a colleague to explain them. Instead, she took the road less travelled: she just scarpered. There might have been a little bit of traumatised mumbling involved, too. Shortly afterwards a waiter, a slightly older chap, came over and listed them for us, unsmilingly (after all that effort I felt like I should order one of them but they didn’t appeal so I didn’t. Sorry). The menu was very much on the conventional side – antipasti, pasta, pizza and meat dishes – so conventional as to be barely worth explaining and with nothing on it I hadn’t seen elsewhere. That’s no crime, especially in a good, traditional, well-established restaurant but it does make for a pretty boring paragraph in the review, so apologies for that. The wine list was pretty traditional too, sticking to traditional Italian wines (chianti, pinot grigio, gavi, Barolo, all the greats), although I was pleased to see a decent selection of five half bottles. We had a half bottle of valpolicella for under a tenner and found it very easy to drink: fruity, juicy and not too heavy for a school night. The starters were decent but unexciting. 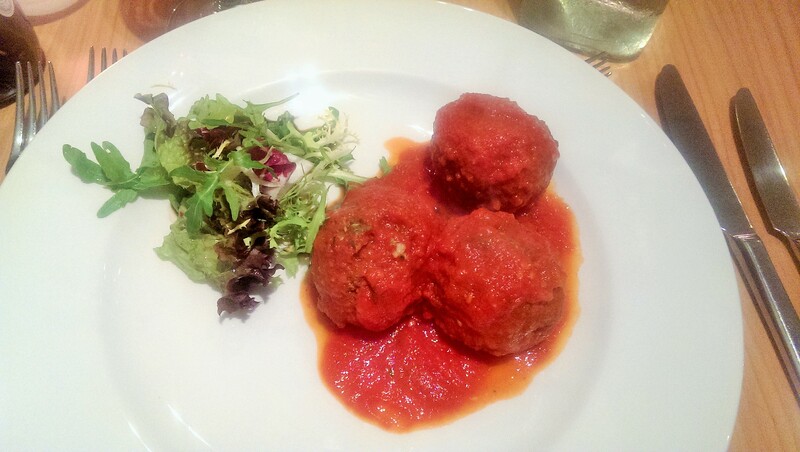 I liked the polpette rustiche: three beef meatballs with a decent dollop of tomato sauce. If there had been two, I would be packing this review full of all sorts of double entendres (it’s hard to resist as it is) but having three rather than two makes that tricky to put it lightly. They really were tasty – the massive balls (steady on) were coarse, well seasoned and avoided the twin horrors you often risk with a dish like this, of either being disturbingly smooth or chewily bouncy. The handful of salad on the side was, as so often, a not very decorative waste of time and really didn’t go. 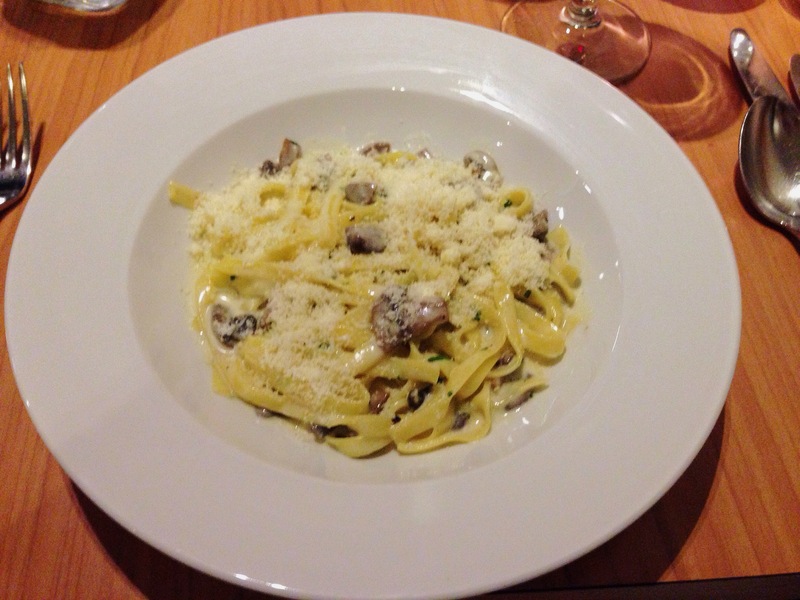 The fettuccine ai funghi was also competent but not exactly thrilling. Cream, garlic, pasta and mushrooms is a combination it’s hard not to like and so it was here, but it still felt like Italian food on autopilot. I was hoping for wild mushrooms (as you’d get at, for instance, Pepe Sale) but instead got little slices of what might have been button mushrooms. The pasta was very regular, which made me dubious about whether it was made on the premises. 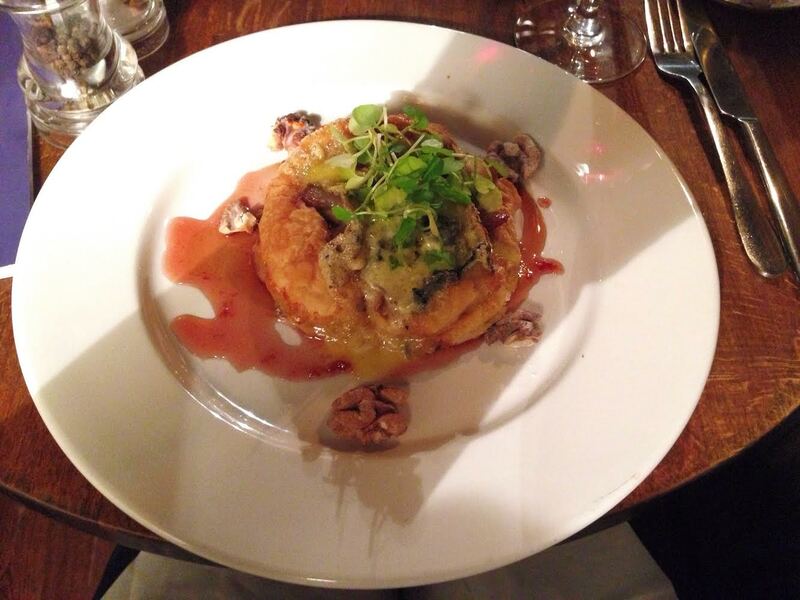 It wasn’t a huge portion – which, as a starter it shouldn’t be – but for eight pounds it felt distinctly unspecial. I had high hopes for the pizza, because one thing Reading lacks is a truly amazing pizzeria along the lines of London’s Franco Manca or Pizza Pilgrims. Having eaten the pizza Parma at Quattros, I can safely say that it’s still lacking one: the base was too thick and doughy, especially considering the menu describes it as “thin crust”. The tomato and mozzarella base was good but the parma ham was underwhelming. 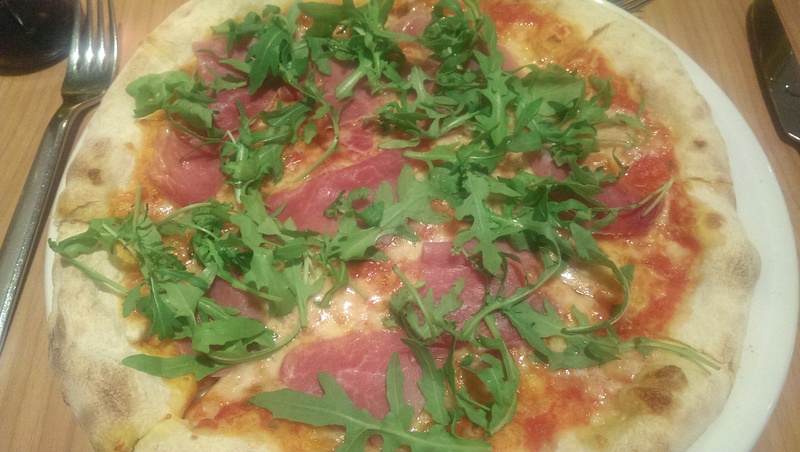 For a pizza like this, where the meat goes on after the pizza is cooked, I like the ham to be so thin that it’s delicate and translucent. This was on the bacon end of the meat thickness scale and was on the bright pink end of the ham colour spectrum (if there isn’t a ham colour spectrum I might just invent one. Or just start a band and call it that. I could release picture discs that looked like disappointing pizzas! But I digress) rather than the beautiful dark marbled hue of a truly great roll-it-up-and-eat-it-with-your-bare-hands prosciutto. When a pizza only has a few ingredients I want those ingredients to really sing, but these mumbled like the waitress. Oh, there was rocket too but the dish hasn’t yet been invented that can be redeemed by rocket alone. I managed about half before giving up. 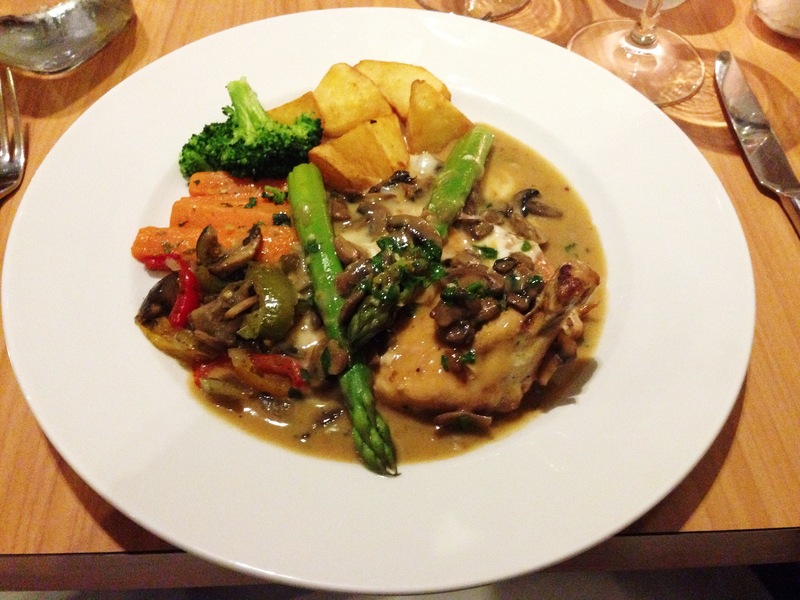 The other main was delizia di pollo – chicken supreme with asparagus and taleggio. This was better: the plate was no looker but the flavours made up for that. The big spears of asparagus were perfect, with just enough bite and the chicken was tasty and tender. I expected it to be stuffed with taleggio but instead the plate was covered in molten cheese: I’m not really sure how it got there but I wasn’t complaining. Good accompaniments, too: some properly sautéed potatoes, carrot, broccoli and some roasted peppers. All in all it felt – and looked – like something a friend might serve up at home, and I enjoyed it. Did I sixteen pounds ninety-five enjoy it? Hmm. After the mains it took a little while for the dessert menu to arrive which meant we just about managed to find room. All of the desserts are cold (which rather reminded me of an old fashioned dessert trolley – you can have anything you fancy, as long as it doesn’t require cooking) but the selection is a little better than the average tiramisu, ice cream, chocolate brownie selection at so many other traditional restaurants. 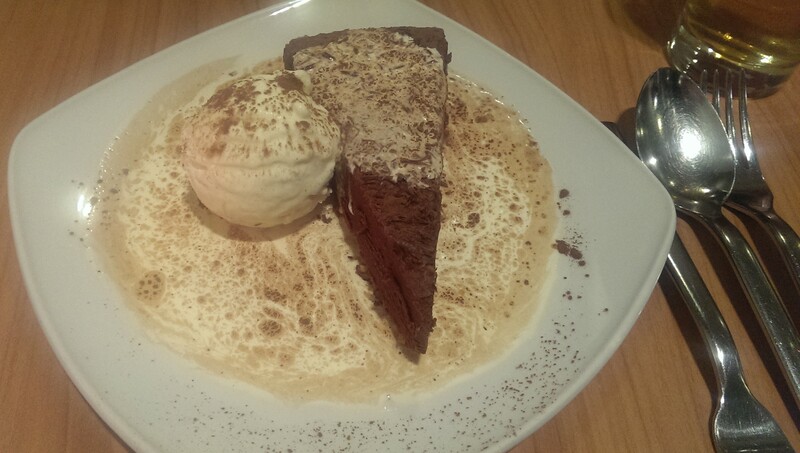 We went for the torta al cioccolato con amaretto: a generous slab of thick, rich, chocolate ganache flavoured with Amaretto on a thin, crisp biscuit base (so big I was glad we shared it, and I’m not normally one to baulk at a challenge in restaurants). It came with a scoop of smooth vanilla ice cream, which I quite liked, and a gigantic puddle of single cream, which I thought was baffling and unnecessary. Still, it’s a minor complaint about a really good, very tasty block of chocolatiness. Service was probably the most surprising element of the whole evening: it seemed like I was visiting a completely different venue to the one I’d read so many glowing reports of on TripAdvisor. The (senior?) waiter seemed a little distracted, although he did offer a liqueur on the house at the end of the night. The waitress was doing the majority of the legwork – taking orders, carrying plates etc. with the bare minimum of human interaction but without ever really seeming like she knew what she was doing. At one point, after we’d finished a course, she asked “Was your food fine?” rather than “Did you enjoy your food?” and it felt like a Freudian slip, suggesting that they were aspiring to adequate. The total bill, for two starters and mains, one dessert and half a bottle of wine was fifty-six pounds, excluding service. I know that’s not a big number but for the quality of the food, the atmosphere of the room and the experience I could have been in any one of Reading’s countless Italian chains. If you put Quattro next to a Jamie’s Italian – which, whether it’s authentic or not, has dishes that are full of interesting flavours and packed with fresh herbs – I would pick Jamie’s ninety-nine times out of a hundred, even though the service and the tone of the menu brings me out in hives (“lovely lamb lollipops”, anyone?). I’m sure at least a few loyal customers will be reading this up in arms, and all I can say is that I’m sorry. The best restaurants feel like a club that you’re part of, but I didn’t feel like I was that night: perhaps if you’re a regular you have a very different experience. But it’s clear that Quattro’s doesn’t need a glowing review from me to fill its seats; it’s doing that anyway, with food that’s just good enough and service that has enough people going back time and time again. But I just didn’t get it at all I’m afraid. For me, the food was a bit like the wine list; traditional, unsurprising, ever so slightly uninspiring. For everyday dining that’s right on your doorstep maybe that’s all you really want, but to get me across town to Caversham I’d need more. When even the waitress can’t remember the specials, it’s just not special enough. If you’re surprised that I’ve written a review of Bill’s the main thing I can say is this – me too. I had written it off: it’s always struck me as a chain trying its damnedest to convince people that it isn’t one, the rustic reclaimed school chairs and blackboards full of homespun quotes a sleight of hand concealing a respectable-sized chain (over fifty restaurants and growing), backed by Richard Caring, who also owns or has owned parts of Strada, Carluccio’s and Cote. So I was surprised when someone suggested I review the place, but he made some interesting points; it wasn’t a chain when it came to Reading, he said, and it offers something different to other Reading restaurants. My first instinct was to say thanks but no thanks, but then I thought about it a bit more. I’ve always said that not all independents are good and not all chains are bad, and one of the plusses of writing Edible Reading has been eating at restaurants I’d otherwise never have considered. Why shouldn’t that apply to Bill’s, too? So I found myself sitting in Bill’s on a weekday night, at one of those reclaimed chairs (are they reclaimed, I wonder, or do they have a supplier who makes all these distressed-looking chairs, tables and defeated-looking leather armchairs for them?) reading the menu, not entirely sure what I was doing there. It is, it has to be said, an attractive space. Bill’s has taken over one of Reading’s loveliest buildings, at the bottom of Chain Street, looking out over the churchyard of Reading Minster. It’s grand and imposing from the outside, but warm and cosy inside (and the outside space, usually packed with people enjoying breakfast and lunch in the summertime, is one of town’s better al fresco spots). It seems a bit churlish to point out that it looks and feels identical to the site in Brighton that I went to long before the expansion, when there were only two branches and they were owned by the titular Bill – after all, most people wouldn’t realise they were eating in a clone. But I did, and it was a little unnerving. The menu was uninspiring. It felt like a beige selection of dishes with little or no signs of seasonality (starters were mainly salads, which I don’t mind per se but didn’t feel especially autumnal). The mains – drawn up by a focus group, perhaps – were almost calculated to be inoffensive, so there were some burgers for people who like burgers, steak for people who like steak, a couple more salads, a curry for people who like curry, a risotto for people who are plain out of ideas and a duck pie and fish pie for people who like to help restaurants make healthy profits on mashed potato. Starters were not promising at all. 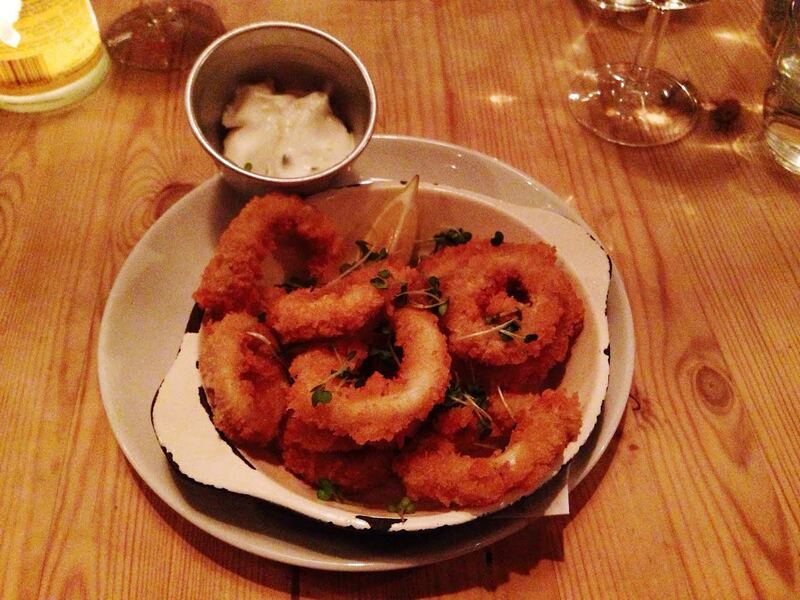 The nicest thing I can say about the calamari is that they were reasonably fresh and you got quite a lot of them (comments that could equally apply to, for example, a bag of apples from M&S). But they didn’t taste of much. It was just a pile of panko coated nothingness, served in the kind of irritating bowl that made it impossible to take them out or cut them with a knife and fork. There was also a big bland lake of something which professed to be garlic and lemon mayonnaise and tasted of neither (in fact, until I read the menu I assumed it was an underachieving tartare sauce, I still think it might be). The halloumi, chickpea and couscous salad was, well, OK. It was three slices of nicely grilled halloumi on top of a saucer of couscous which had a few but not quite enough interesting things mixed in; pomegranate seeds, tiny bits of fresh mint and some yoghurt. I wish I’d counted the chickpeas as I am pretty sure they didn’t scrape into double figures and the tomato was easy to count because, despite being mentioned on the menu, that was a big fat (or rather a tiny skinny) zero. It was fine purely because of the salty, squeaky grilled halloumi on top: the rest was just background noise. But how much skill does it really take to grill some halloumi? 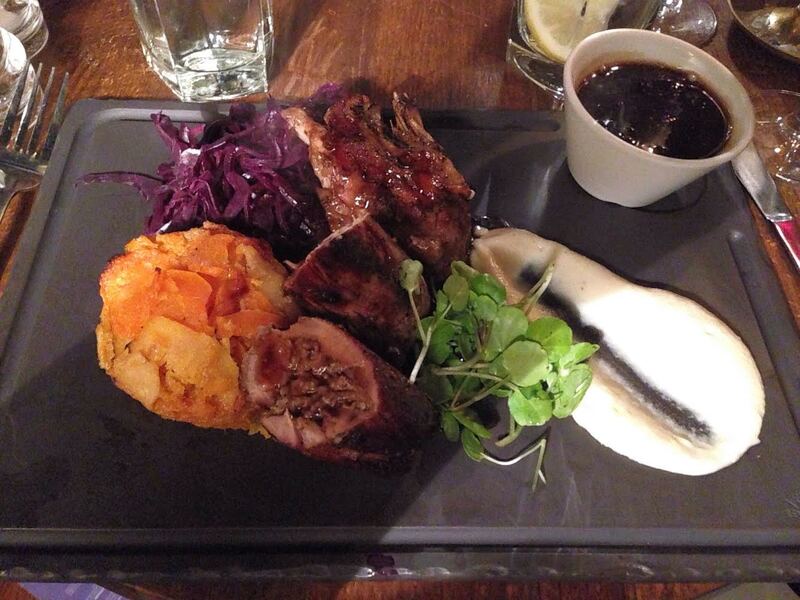 By this stage I fully expected the mains to be terrible, but bafflingly they weren’t. Hake with rosti and salsa looked the most potentially interesting thing on the menu and was a genuine delight – a firm square of well-seasoned, well cooked fish with a salty, crispy skin and lovely big flakes, on top of something that wasn’t really crispy enough to be a rosti but was pleasant all the same, a potato cake shot through with parsley and spring onions. The coarse salsa it was served with – sweet halved cherry tomatoes, cubes of avocado, a smattering of capers – added the freshness the dish needed, although it was fridge-cold which jarred with the other components. Really though, it was lovely, and at just under twelve pounds it felt like a decent, sensibly-priced dish (although maybe not a popular one: looking at most of the tables around me all I could make out was brioche bun after brioche bun). The menu was so lacking in other choices I fancied that I went for fillet steak, from the specials menu (although I’m not sure what’s so special about a fillet steak when the rest of the year Bill’s does rump, sirloin etc.). That quibble aside, it was spot on: a nice hefty steak, cooked exactly as requested (rare, in this case) – something you should be able to take for granted but so often can’t. And some attention to detail had gone into the accompaniments. The watercress was properly dressed and delicious rather than just token greenery, and the potato gratin – a generous portion in a little cast iron pan – made a pleasant change from frites. Still, a twenty quid dish (or twenty-one if you add garlic butter as I did; I figured in for a penny in for another pound), and as much as I enjoyed it I did find myself thinking about all the other dishes you could buy with that money in Reading. The dessert menu also left me cold. It felt like there was very little there I hadn’t seen dozens of times before: crumble, cheesecake, eton mess and brownies (brownies never really feel like dessert in a restaurant to me, just a lazy way to flog you cake instead). Again, I could almost visualise the focus group, round a boardroom table, deciding whether pecan pie was a good choice or just a little too “out there”. 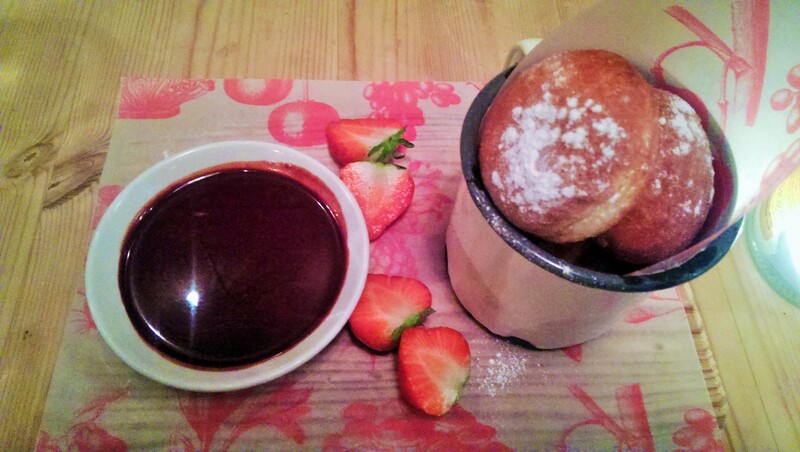 So we shared the only dessert on the menu that remotely made me want to order it, mini cinnamon doughnuts with fresh strawberries and chocolate dipping sauce. (Strawberries was only just plural – two, cut into halves.) The chocolate sauce was pleasant enough, smooth and dark, more of it than you could possibly need. But the doughnuts were disappointing. Good fresh doughnuts should be big, warm, fluffy, irregular cloudlike things with a gorgeous sugary shell, but these were heavy and stodgy with an afterthought of icing sugar; they didn’t deliver an ounce of that promise. Many of my friends have criticised the service in Bill’s in the past, which meant that I maybe wasn’t quite as disappointed by it as I could have been. My waitress was friendly and pleasant, but the constant calculated upselling (almost as if from a script) got wearing very quickly. No, I didn’t want “nibbles” (and, in fact, I have a real problem with food for adults being called “nibbles” at all). No, I didn’t want any extra sides with my main courses. No, I didn’t want an extra glass of wine. No, I didn’t want coffee and/or tea. At the start it just about felt like she was drawing my attention to things on the menu that I might have missed, by the end I felt like politely explaining that, however it might appear, I did actually know my own mind. Actually, the wine was quite good: the white was an unusual Brazilian pinot grigio/riesling blend which was off-dry, round and fruity and went well with the fish dishes (even if the first glass was nowhere near cold enough) and the red was rich and juicy although, ironically, a little on the chilled side. Reasonably priced, too – I’ve had the same white at Malmaison where it costs a pound a glass more. The bill for two starters, two mains, a dessert and four glasses of wine came to £75 (which includes a 10% “optional” service charge, about the only thing the waitress didn’t ask me if I wanted). 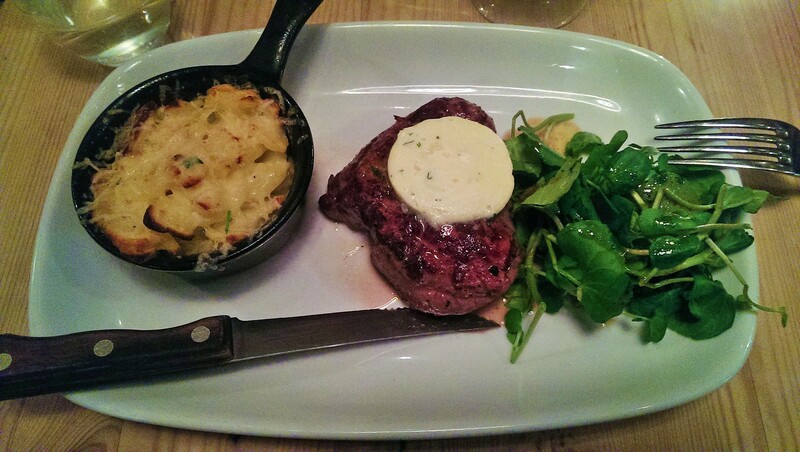 That probably makes the place look more expensive than it was – the starters were around the five pound mark, so it’s the fillet steak’s fault. It would be easy to turn round and hammer Bill’s for being a faceless, cynical chain. But, as always, the truth is a bit more nuanced and complex. So no, it doesn’t offer something you can’t get anywhere else in Reading. Quite the contrary, in fact: I can think of other places I would sooner go if I wanted green Thai curry, or calamari (although nowhere in Reading does really good calamari, more’s the pity) or burgers, or steak – many of them independent places. But perhaps that’s missing the point about Bill’s. Its popularity, like it or not (and it is popular – it was packed on a Monday night) is down to the fact that it offers something for everybody, an upmarket version of all you can eat überbuffet Cosmo, if you like. So I can see you might go there with a group of people who don’t have strong opinions about food, or who have very different opinions about food, or people who plain can’t decide what to eat. The food is decent enough, some of it is pretty good value and eating there is never going to class as a gamble. So did my visit change my mind about Bill’s? Kind of, I suppose: before I would have actively refused to go there whereas now, if I was going out with friends and they insisted on eating at Bill’s, I’d tag along. But in the back of my mind, I’d be thinking that it’s on Chain Street for a reason. As regular readers will know, the overwhelming majority of restaurants I review are requested by people who read the blog week in, week out. If there’s one thing that comes out of those requests, it’s that you really want to see reviews of pubs that do food. And that, generally speaking, means leaving Reading and heading out into the countryside. There’s only one problem with that, which is that a lot of pub menus look really uninspired. In fact, once you read enough of them they all start to blur into one. They all do a burger, they all do fish and chips, they all do sausages and mash, they nearly all do confit duck these days. They’re all so similar, in fact, that you start to wonder if they’re all being supplied by the same person, perhaps in a big lorry of some description (surely not). So I’m afraid I’ve cut a lot of the pubs from my to do list. They might be well worth a visit if they’re your local and you can stagger home afterwards, but I think they have a limited appeal for people those of us who would need to drive out into the sticks to go there. 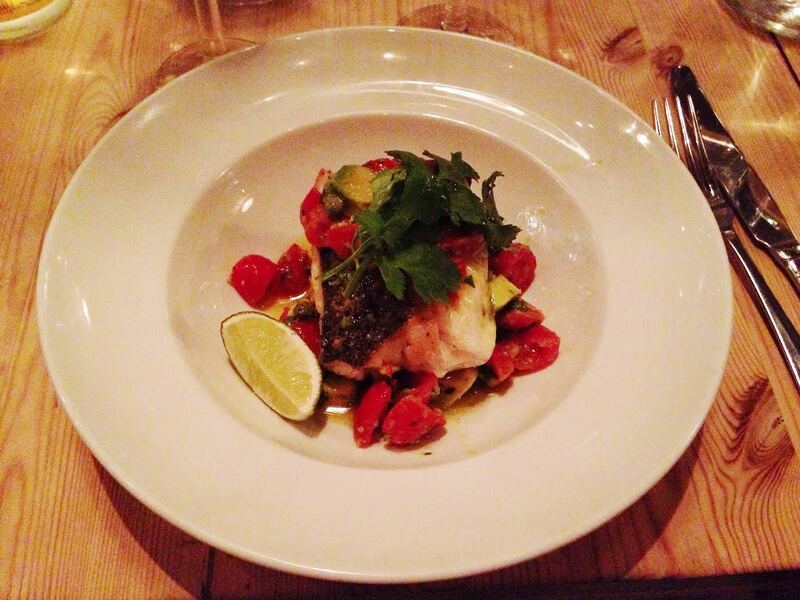 If I’m going to forego the delights of more than a solitary glass of wine I do want to feel like the food is worth it. So what stayed on the list? Pubs that had menus with a little bit more about them. Menus with interesting combinations of ingredients. Menus that weren’t going through the motions and dead behind the eyes. The Bull at Sonning was one of those pubs, so I turned up there on a midweek night to see if my menu spotting skills had let me down. It really is a beautiful pub, inside and out. It’s your typical ancient timbered pub with enough low beams to require a special stooped walk, lest visitors wake up to find themselves on a trolley at the Royal Berks. It has a warm, inviting fireplace in the front bar, mismatched furniture all over the shop (I don’t think I saw two tables the same) and loads of nooks and crannies, just as an authentic pub should. Eating there a deux, in a little table tucked away, felt beautifully conspiratorial. What is also has, on a cold it-feels-like-winter-even-though-it-was-sunny-only-last-week school night is an absolutely packed bar and dining area (it was impossible to tell how many people were locals and how many had been drawn there by the recent not very extensively reported news about properties in the area – really, the Sonning residents should have worn badges, or red trousers, or both). I got a sinking feeling when I looked at the Bull’s menu again and started to think I might have made a mistake. It’s a big old menu, broken into two parts: a section of pub classics on the one hand and what they term “chef’s creations” on the other. This felt like an awfully brave, rather clumsy (and slightly silly) way to describe half of your menu. I was also, and this is probably a bit unworthy, put off by the typos: the menu extolls the virtues of eating “seasonably” and includes “noddles”, which made me chuckle (I thought you were meant to use these but not necessarily cook with them). As if those fourteen main course options weren’t quite enough, there was also a handwritten sheet with half a dozen more specials on it. Things were starting to look distinctly iffy. Well, to deflate the mounting sense of dread nice and quickly, I was worrying unduly: everything I had was fantastic. They may not be able to do a decent job of every single thing on that menu, but they barely made a mistake with anything I ordered (this is why I write restaurant reviews and not mystery novels). 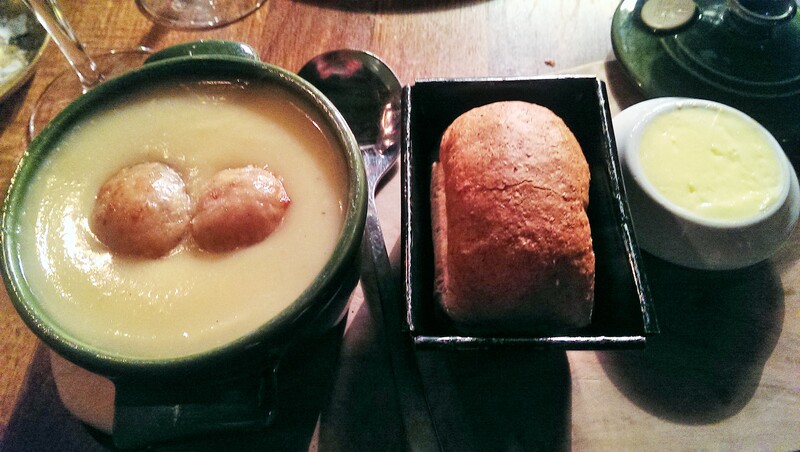 I never order soup, because it inevitably leaves me too full for my main course. But when I saw that The Bull had honey roasted parsnip (probably my second favourite vegetable) soup with chestnut dumplings I was powerless to resist it. I was so glad I had it, too. It came in a miniature casserole filled to the brim with smooth puréed parsnip and nestled on top were two walnut-sized dumplings. On the side was a warm, crusty miniature loaf, in a miniature bread tin, and a small pot of room temperature butter (a detail many places get wrong, and such a bugbear of mine). This dish was a good example, I think, of why I’d picked The Bull to review. The soup was very good – maybe a little underseasoned (a touch of spice would have gone well here) but beautifully sweet and smooth. But what elevated it were the extra touches – the bread and in particular the dumplings: rich and soft with their own hint of sweetness from the chestnuts. The loaf was slightly chewy (I wondered if it was quite as freshly baked as it appeared) but was more than up to its two main jobs: having butter melted onto it and being dunked into the soup to make sure no mouthful of parsnip got away. The other starter was equally appropriate on a cold, miserable day and was every bit as delicious: mulled pear and Barkham Blue tart. Some people will read that and turn their noses up, which is fair enough, so perhaps I’m just speaking to the rest of you now, but my goodness it was gorgeous. Soft, spiced, slightly gritty pear covered in molten creamy blue cheese, the rind the only solidity left, all served on a disc of crispy pastry. Again, there were more cheffy flourishes than the dish needed – pickled walnuts around the outside, sweet caramelised red onions (maybe a few too many) on top and a mulled wine syrup traced around the edge. I could have happily eaten a tart like this the size of a paddling pool. It just had everything: sweetness, saltiness, crispiness, gooeyness. Did the mains live up to that standard? Well, to my increasing surprise and delight, yes. Chicken pie, again, is exactly the sort of thing I’d seen and discounted on many pub menus. But here the filling was a slow cooked stew of tender thigh, soft leek and a rich, glossy gravy which was made to be soaked into pastry and devoured with gusto (the pastry, a flaky buttery lid, was perfect for the job). I know some people feel that a dish like this, with a top crust, isn’t technically a pie and I have some sympathy with that view. But it was too delicious for me to care. On the side, a decent but not overwhelming pile of dark, crinkly savoy cabbage simply steamed, buttered and salted: a great ingredient left to speak for itself. The only disappointment was the goose fat roasted potatoes. I’m sure there’s a rule somewhere which says that there’s no such thing as too many roast potatoes but I don’t think it applies when the potatoes are like this: they looked the part but lacked that almost glass-like exterior of a truly great roastie. Instead, they felt chewy and unremarkable, almost as if they’d been reheated. Still, by then I was full and at least, if nothing else, I wasn’t devastated not to be able to finish them. 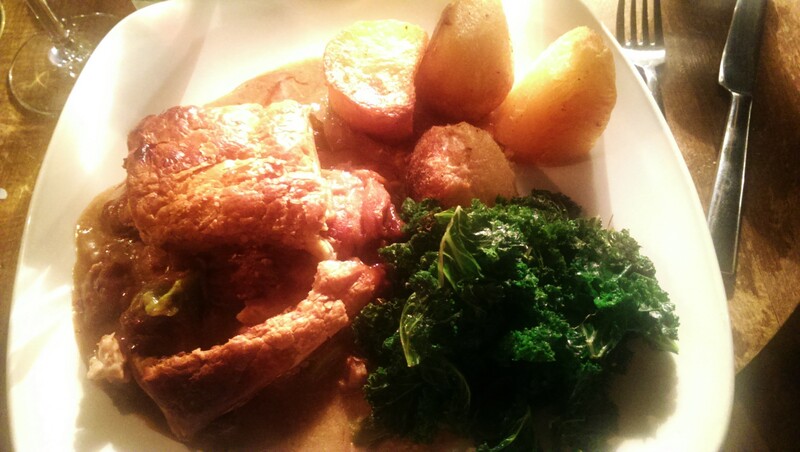 The other main was, despite being on their autumn menu, a wintry and comforting delight. There was so much going on on the plate (or slate in this case, as it happens) that it’s difficult to know where to begin describing it. So there was a confit leg of pheasant – delicious and gamey, if a bit difficult to detach from the spiky, spindly bones. There was a breast, filled with stuffing and rolled almost into a ballotine, rich, salty and herby. There was a big pile of red cabbage, full of the flavours of winter, a giant heap of spiced comfort. There was a root vegetable dauphinoise, so imaginative compared to a bog standard potato gratin, with a whack of garlic offsetting the sweetness of carrot and parsnip. And there was celeriac puree. It was described on the menu as “flavour bursting celeriac puree”, which again I found more than a little silly, but the last laugh was on me because it was exactly that – sweet but punchy, a little went a very long way. Bringing it all together was a little jug of something which was described as “mulled wine sauce” on the menu but just tasted like amazing gravy to me. I smiled from beginning to end while eating this dish: if plates of food were people, I’d have married it. That main, as it happens, was recommended by our waiter – although, having read the description on the menu, I probably still would have ordered it if he’d said “my one tip is to avoid the pheasant, I’m pretty sure it has bits of asbestos in it”. But the service overall was pretty decent considering how full the place was. There were no empty tables when I got there, no empty tables when I left and the bar got buzzier as the evening went on. What were all these people doing in Sonning, a village which never troubles the national press? Your guess is as good as mine. I’m sorry to confess that I’ve let you down, because I didn’t order dessert; I just didn’t have space (I blame all that soup) and there was nothing light enough that I could have managed it even after a breather. In any case, the dessert menu is probably the most conventional thing about the pub – brownies, sticky toffee puddings and the like – so I’m not sure I missed much, though I imagine they’d have done it well. Maybe with winter coming I’ll have to get into training to make sure I can manage all three courses. So instead, we settled up and left. The bill, excluding tip, came to sixty-two pounds. Apart from the two courses each we had a couple of pleasant, if unremarkable, glasses of red and a couple of drinks in the bar beforehand (the wine is much better value than the cider: a pint of cider is eye-wateringly close to a fiver). The main courses were definitely more at the restaurant than pub end of the price scale – the pie was fifteen pounds and the pheasant was seventeen pounds – but more than worth it, I think. I can’t help but feel that the Bull has justified my new approach to picking pubs to eat in. It was a bit of a rollercoaster – I was excited before I turned up, distinctly unconvinced when I got there and then thoroughly wowed once the food arrived. The food was far better than I expected and got the balance just right – close enough to standard pub food not to alienate people who want that sort of thing but with just enough personality to interest people who are looking for a little bit more. What can I say? It won me over. If I lived in Sonning I would come here all the time, and as it is I’m wondering how quickly I can get away with going back. Maybe the village’s newest and most famous resident will drop by at some point; if she manages to get the Elgin Marbles returned to Greece I can’t think of anywhere more appropriate to celebrate.